Sometimes the zero waste swaps that look the simplest have layers of questions underneath. When I wrote about switching from liquid hand soap to bar soap last summer, I touted it as the easiest zero waste swap I’d made. And yet, that glossed over some of the aspects of bar soap that don’t come into play when you have pump soap. Readers asked, how do you keep the bar soap from staying wet and getting slimy? How do you store a bar in your shower without it disintegrating under the water stream? In other words: sure, this switch might be easy for you, but it hasn’t been so easy for me. Except for a few bottles of refillable body wash still kicking around in our shower, these days we use bar soap exclusively. Bar soap is less likely to come in plastic packaging than pump soap, and it takes about one-fifth of the energy to manufacture, as well. So in our house, there’s a bar by the kitchen sink, one by the bathroom sink, and a bag of soap ends in the shower for sudsing up, for those who prefer bars to liquid body wash (me). The day when one bar runs out and we get to choose the next from a small under-sink stash is always a banner day. Lately, we’ve been using bar soap from Bestowed Essentials. The creator Callee makes zero waste bath and beauty products in her solar-powered studio on wheels as she travels the United States. Her small-batch, certified vegan and cruelty-free soap bars, face masks, and other products are inspired by her travels and her experiences as a zero waster herself. This means that her products are packaged in recyclable or compostable packaging (typically, recycled cardboard or glass), and are shipped using boxes and packing material made from recycled fibers. In case it’s helpful, here’s a peek into the bar soap set-up we use these days. It keeps soap dishes from sliming, soap bars from disintegrating, and has overall made the jump to bar soap a pure pleasure. -Choose a slatted soap dish. In my experience, water pools in soap dishes that don’t offer it a place to drain. This prevents the soap from drying out fully between each use, meaning that it gets a bit slimy or worse, disintegrates into an unusable mush. A soap dish with slats – or simply a draining soap dish set on top of your usual one – ensures that the bar stays firm and intact. Ours pictured is this one from Bestowed Essentials, which is made from recycled tulip poplar wood gathered from a scrap pile and can be composted at the end of its life. -Use a soap saver bag to corral slivers. When a bar gets so thin that even a gentle rub breaks it into ever-smaller pieces, we transfer the pieces to a soap bag. This corrals smaller pieces so that you can use them without worrying they’ll slip through your finger and down the drain. 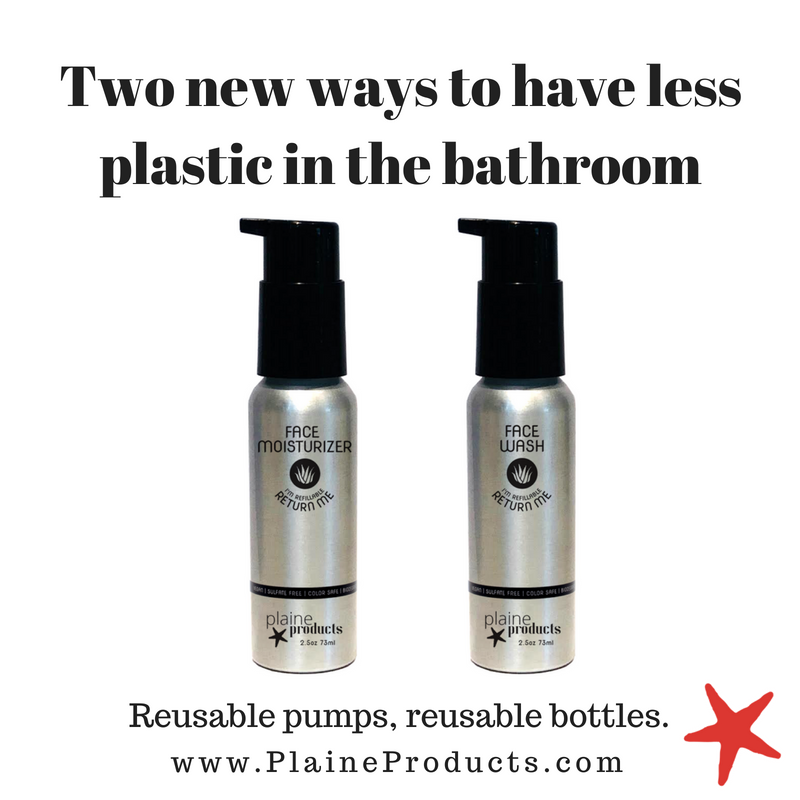 Plus, the rough texture acts as a plastic-free loofah in the shower, and since it’s made out of natural sisal fibers, it too can be composted at the end of its life. -Keep it out of the shower stream. When you keep bar soap in the shower, try to store it in a place where it won’t be hit by the spray. We keep our metal shampoo bottles on the shelf closest to the spray and our bar soap and bag of soap ends on the shelf farthest from it. This helps the bar soap stay dry, an essential to its long and happy life. In particular, I love the calming scent of the cucumber + spearmint soap shown here. Each soap is a blend of natural ingredients for maximum gentleness and healing, oftentimes a mix of powerhouse ingredients that are kitchen staples of the home cook and herbalist, like turmeric + calendula or Florida orange. (Or, ahem, a pumpkin spice bar for all you autumn lovers). Once you find ­­­­a scent you like, you can even purchase a bulk loaf of soap in lieu of individual bars, cutting down on packaging waste even further. (Each loaf is equivalent to just over eight bars, making it a more economical option, too). You can find Bestowed Essentials’ full line of bar soaps here. Or, peek at their plastic-free toothpowders, face masks, and more. And, if you’d like, you can save 15% off your order using the code LITTERLESS. Other questions / bar soap dilemmas I can answer? Any other concerns holding you back from making this zero waste switch? (This post is sponsored by Bestowed Essentials, a collection of ethical and eco-friendly personal care products). I’m not historically the most efficient packer out there, which perhaps is why I felt inordinately proud of myself this past Labor Day weekend. After I threw all my clothing in my favorite weekend bag to head to a lake house with friends, said bag remained a good one-third empty. I marveled at its lightness and the way the top of it squashed down, a far cry from my usual luggage, which is full to the hilt and more. I’m learning to be better about choosing multipurpose items when I travel: instead of pajamas, leggings that work for yoga or lounging or sleeping. Instead of three handkerchiefs, a handkerchief and a cloth napkin and we’ll see how it goes. In my arsenal since earlier this summer, the soap stick from Meliora Cleaning Products. It’s intended to serve as a laundry stain remover, which it does with aplomb, but since I’ve been carrying it around with me, I’ve found it works for other things, too. It does dual duty as bar soap in a hotel bathroom where you’d rather not unwrap the plastic-packaged bar by the sink. Or, dare I say, the gas station bathroom that is somehow out of soap entirely. Typical plastic stain removal pens not only aren’t recyclable, but they also can’t serve as hand wash in a pinch or make suds for sock washing in the sink. They’re full of junky and toxic chemicals that you probably wouldn’t want to wash your hands with, even if you could. Conversely, Meliora’s stick is just soap. Soap that’s been especially formulated to optimize stain removal – Kate and Mike, the founders, are both engineers and trust me when I say I’ve heard them get deep in the weeds on the science that makes their products so effective – but also soap that you could use as a body wash if you need to, or for rinsing out duds in the river on a camping trip, or for lathering up your kid’s hands in the park. Or, say, the power went out at the lake house you and twenty other people had rented for Labor Day just at 7 pm when you were all trooping in from a day swimming in the lake. Since the running water for showering was out too, of course, you might want a biodegradable soap that you could jump right back in the lake with and lather up. Same applies to backpackers and camping enthusiasts. I’m glad to have a multi-use option that lets us lighten both our load and the planet’s. A few further details: the soap stick comes packaged in a cardboard box, which you can recycle or keep around for storing it. For traveling, it’s hard-wearing enough that it won’t crumble if you tote it around in a bandanna, napkin, washcloth, or small travel tin. I keep one with my travel toiletries, near our washing machine, and sometimes carry one in my tote bag, too. The soap stick is also palm oil-, cruelty-, and fragrance-free, and boasts the Made Safe certification. 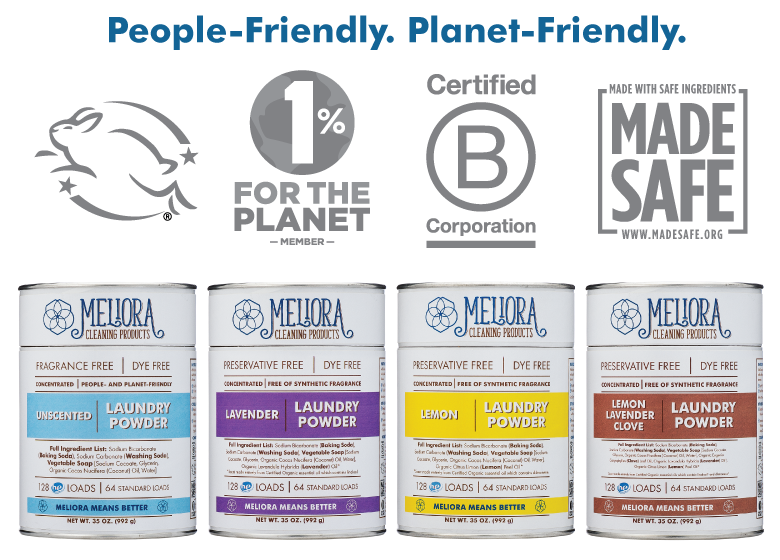 (Not to mention that Meliora is also B-Corp and pledges 1% for the Planet; you can learn more about their certifications here). You can find the soap stick on their website right here, or browse their other products, like laundry detergent and an all-purpose cleaning spray that we’ve lately become entirely reliant upon for nightly kitchen straightening. Orders placed on their website come packaged in a cardboard box with all-paper wrapping, including paper tape. And if you live in Chicago, where they’re based and do their manufacturing, you can find Meliora products locally at Dill Pickle Food Co-op, the Whole Foods at North and Clybourn, and at Sugar Beet Food Co-op, which also carries their laundry detergent in bulk. Swapping cloth produce bags in for plastic produce bags was one of the first zero waste changes I ever made and one of the best. I have a visceral reaction to the squeaky sound that clingy plastic produce bags make as you attempt to get them open; once I learned more about plastic pollution and waste, I developed an environmentalist's aversion to them, as well. There are a few zero waste changes where I've never had a moment's regret for making the switch - menstrual cups, bamboo toothbrushes, cloth napkins - and this is one of them. In case it's a change you haven't made yet, I put together my favorite resources for finding cloth produce bags. They're easy to make, and even easier to buy. I look for produce bags that are all cotton or linen. While I've also owned plastic mesh produce bags which have ripped within a year of use, my cotton and linen bags I've had for years and nary a hole. Below, tutorials for those who'd like to make their own, and a list of favorite brands for those who wouldn't. Some of the links below are affiliate links, which means Litterless may make a small commission on items purchased. -Tie a furoshiki cloth: The simplest produce bag of all is one that starts with a square of fabric - a tea towel, a napkin, an un-hemmed scrap. In a pinch, you can place produce in the middle and then tie the edges together to form a small sack. I've made use of this technique when caught at the farmers' market without a spare bag (evidence, here). -Sew a drawstring bag: If you've sewn before, making your own produce bags is simple to master. I've made my own in the past, and I like that you can make any size you need. Two recommendations for those planning to DIY: I use French seams for mine, which ensures that edges left unfinished don't fray into whatever food you're buying. And, wash and dry the fabric several times prior to cutting and sewing to pre-shrink it. Around here we've ended up with a few accidentally shrunken bags, once fit for a baguette and now more suited to buying bulk carrots. If you're new to sewing, this homemade cloth produce bags tutorial is helpful. -DIY Bento bags: You can also, of course, sew your own bento bags. They're a piece of fabric wizardry that, with a bit of folding and pinning, turns a single length of cloth into a three-dimensional bag. Once you have a few of these, you'll find you use them for everything: in addition to holding produce, mine have been knitting project bags, lunch boxes, dopp kits, foraging bags, and gift wrap. Here's a pattern for making your own. -Simple Ecology: The first produce bags I ever purchased, my set of Simple Ecology bags from the summer of 2014 is still going strong. A bit stained, a bit softer, but no holes or worn patches to speak of. The external tags on the bags note the tare weight in ounces and grams. -EcoBags: I like their mesh bags for larger items with skins like oranges and onions, and their solid cotton bags for smaller items like bulk salad greens, grains, or nuts. They also have a three-piece set of printed bags, but it's made of a thinner cotton that feels a bit flimsier. -Ambatalia: Molly DeVries makes beautiful, reusable cloth goods for the home out of her studio in Mill Valley. Her bento bags are among my very favorite produce bags. I have a large one for bread and greens, and a few smaller ones that I use for everything from organizing snacks while traveling to buying a few apples to keeping small items corralled in my daily tote bag. She also makes a jar tote bag with fabric dividers for easier bulk shopping. -Dans Le Sac: Made in Quebec out of tough, heavy-gauge cotton, these bags are long-lasting and designed to hold specific items. If you're a weekly baguette buyer, their long and skinny baguette bag may just solve all (or at least some) of your worries. See also their bread bag or drawstring sacks. -Small makers: There are some beautiful ones available on Etsy. I love this selection of bags in printed linen, or these bread bags in solid colors of linen. This set shows the tare in ounces, pounds, and grams, which is helpful when checking out. Other favorite produce bags to make or buy? What are you using these days? Make or Buy is a series that acknowledges that sometimes we want to make things ourselves, and sometimes we want to buy their sustainably made equivalent. Other zero waste gear to make or buy, here. It's safe to say my partner Julian is a fountain pen pro. For him, they're a favored daily tool, at least one always tucked into his pocket (no ink explosions yet!). Since they're refillable, fountain pens are also a zero waste alternative to the plastic pens that are designed to be disposed of once empty. But they can also be a bit daunting at first (I still sometimes need help with mine!). Julian kindly offered to share a mini tutorial with us; here's what he has to say. (Note: this post contains a few affiliate links). With widespread access to smartphones and an overwhelming list of to-do list and note taking apps, it's safe to assume that reliance on pen and paper has decreased. Like many people, though, I still and enjoy writing the old-fashioned way. I'm no Luddite (I use Evernote extensively to supplement pen and paper), but there's something more convenient about grabbing my favorite notepad and scrawling a grocery list before I can unlock my phone and find the appropriate app. Physically crossing things off of my daily to-do list is way more satisfying than tapping a checkbox. Even before I first became aware of zero waste, I cringed every time I dropped an empty Pilot G2 in the trash. Sometimes, I even wishfully put them in the recycling bin, hoping that magically the plastic would be reused. Eventually, I began purchasing refill cartridges and kept the same pen body. In many cases, the available or affordable pens are not refillable (e.g., Bic). For some pens, you can recycle the bodies or ship the empty product to a program like Terracycle. This is a reasonably good solution, but recycling requires energy. If possible, it's preferable to avoid introducing new pens into the waste cycle. My solution is simple: the fountain pen. To some, it may appear archaic. Fountain pens certainly did to me when I first found dried up Parkers in my parents' pen cups. They didn't write smoothly and made a mess of the paper and my hands. What I didn't know then is that the ink had dried in the pens due to years of sitting idle and with some easy reconditioning, they would work well. -Fountain pens are designed to be refilled with ink, which may be purchased "in bulk" in glass containers. This obviates the need for additional plastic refills. -There are many economical pen options that are made mostly of metal. -The pens will last for far longer than a typical ballpoint pen if treated correctly. There are, however, some obstacles to getting started with fountain pens. Fountain pens offer different writing styles based on the width and material of the nib, the ink you choose, the paper you write on, and even the way you hold the pen. You may have to experiment a bit to find what works best for you. -LAMY AL-Star: Time and time again this pen comes up as highly recommended. The nib writes extremely well, the metal pen is well-made and has a minimum amount of plastic, and the body is comfortable to hold. The clip on the cap makes it easy to bring with you. Plus, you can buy replacement nibs, ensuring this pen will last decades. -Diplomat Traveller (pictured here): This is a nicely weighted metal pen with a quality nib. It is slimmer than the AL-Star and is more at home in a shirt pocket (if that's of interest to you!). -Pilot Metropolitan: This metal pen comes in a variety of patterns and colors and is the most affordable of the bunch. The ink cartridge system is proprietary, but if you order a converter and refill it with ink from a bottle, this isn't a limitation. Next, select a good quick-drying ink to make quick notes more accessible. Watery inks will smear if you smudge them (for example, when noting the PLU of an item in the bulk aisle on a piece of plastic-y tape). -Noodler’s Q-E'ternity: Quick-drying and smear-resistant ink that works well for paper on which fountain pen inks typically bleed. -Pelikan 4001: This ink comes in several vibrant colors and dries even faster than the above. A bottle of either of these should last you years - or, you can plan split several bottles with a friend (or even one bottle among several friends!) until you find one you like. When you purchase a pen and bottle of ink, be sure to purchase a converter, the piece shown above with the red cap. These piston devices replace the small disposable plastic cartridges that typically feed ink to a fountain pen. When your pen is empty, you remove the body, twist the piston such that it is closest to the nib, submerge the nib in the ink bottle, and draw the piston up to fill the converter with ink. (Here's a more in-depth look at how to use it). After a quick wipe down of the nib on a piece of scrap paper, you’re ready to write! Fountain pens provide an easy and satisfying avenue for reducing waste at your office and at home. While they may seem a bit tricky to get started with, with a bit of practice, you can replace disposables with a reusable option. If you have any questions - about getting started with fountain pens or even if you're a long-time user - Julian loves talking about all things FP. He's planning pop into the comment section below with answers, so ask away! Thank you, Julian! Am I really expected to reach "zero"? How close do I need to get? What are the things I can do now, with my fifty-hour workweek and a toddler? What are the three tools I should bring with me that will fit in the tote I already use each day? Basically: how can I care for the planet without upending my life? The answer to all of these is to go slowly. What I aim for isn’t going zero waste perfectly for a week: it’s going zero waste imperfectly for a lifetime. To try to do everything at once can be daunting; instead, to give yourself time to let your new habits stick ensures that they’ll feel doable rather than onerous. Enter MightyFix. Brought to you by the folks at MightyNest, an online store for sustainable products, MightyFix aims to make it simpler to incorporate eco-friendly changes into your existing routines. For a subscription of $10 a month, each month they send you a small but mighty product to help you make a sustainable swap in your home. Things you might find in your box: beeswax food wraps to replace plastic wrap, woolen dryer balls to replace dryer sheets, compostable dishcloths to replace plastic sponges, stainless steel food containers to replace plastic ones, and more. Though the item varies by month, you can always count on it being zero-waste-friendly, non-toxic, and tested by the team at MightyNest to be durable and high-quality. It’ll come shipped to your door in recycled and recyclable packaging, like a cardboard box or small mailer (where possible, they even mail shipments in reused parcels they've received themselves). The item inside is always worth more than the $10 subscription fee. And, every item on the MightyNest site ships free when added to your MightyFix box, so if you’re feeling like making more than one simple change each month, that’s easy, too. For new subscribers this month, MightyNest is sending out one of my favorite easy switches: replacing single-use plastic sandwich bags with a durable, washable, non-toxic silicone Stasher bag. Unlike some plastic-free food storage containers, these bags are lightweight and easy to throw into any bag or backpack. I use them for carrying snacks and sandwiches, bringing home compost at the end of the day, and while traveling. They’ve been long-time favorites of mine, and would be especially great for lunchboxes. MightyNest is offering Litterless readers their first month of MightyFix for only $3 when you sign up using the code GOLITTERLESS. This post is sponsored by MightyNest, the Chicago-based company making it easy to slowly go zero waste. Thanks so much for supporting Litterless. When switching to cloth napkins over disposable paper ones, I think it's helpful to liberate oneself from the cloth napkin's traditional fussiness. To replace paper napkins, cloth ones need to be as easy as paper napkins. (I've come to find them easier, in fact: no running to the store to grab more, just popping them in with the rest of my laundry when they're dirty). -Don't iron them. Ironing takes cloth napkins out of the realm of the daily and lands them smack dab in the realm of a fancy dinner party. There's no need to add to your chore list: rumpled cloth napkins have a certain casual appeal, and certainly a time-saving appeal as well. -Keep them at each family member's place. Sure, you can give each person a new napkin every day. But for a five-person family, seven days a week, that's either a whole lot of napkins or a whole lot of laundry. Instead, I replace them only when they're dirty, or once or twice a week. You can leave them at each family member's place, in the meantime. (I hang mine on the backs of chairs to keep the table clear. If that's some huge faux pas etiquette-wise, don't tell me, I don't want to know.) Caveat: guests get a clean napkin, always, of course. -Keep enough handy. You certainly don't want to be doing laundry more often than you used to, so when you commit to making the switch, try to gather enough napkins that you won't have to be running loads of laundry every time you want to have a dinner party or your kiddo has a messy meal. I do fine with about ten napkins at a time, but depending on the size of your family, you might want to have many more. -Look for them secondhand. (Or make your own). If cost is an issue, or even if it's not, cloth napkins are a great thing to buy secondhand, bum off your grandmother, or make yourself. (This tutorial for fringed napkins requires no more sewing knowledge than sewing a straight seam, and is the perfect thing to knock out when watching a movie or listening to a podcast). -Stains are fine. (Or choose dark-colored napkins). If you're going to be vigilant about keeping your napkins stain-free, choose patterned or dark-colored napkins in the first place, otherwise you'll just have to sit and grind your teeth as your guest mops up a red wine spill with a favorite napkin, or you'll jump up from the table to run your napkin under the faucet at the first splash of spaghetti sauce. If your light-colored napkins get ruined beyond repair, you can always look up a tutorial for naturally dyeing them - I've done this with friends and it makes for a fun evening. I have some light napkins, though, and through five years of use they've truly been fine. If you inspected them, you might find a few stains, but who's inspecting them? The wonderful upshot of cloth napkins is that once you purchase them once, you'll have them for years to come: a simple change that you can make once and reap the benefits of for a long time. I've found them so easy to use: have you? Any other tips to share? Previously in Simple Swaps: Bar soap, and a laundry DIY.